One of the most common visits to the office is for hip pain. Sometimes this pain is localized to the buttock, sometimes to the lateral side of the hip over the trochanter down the side of the thigh and past the knee. Sometimes there is pain in the groin. Sometimes it extends down the back of the leg in a sciatica distribution. Folks describe this as a burning type pain. 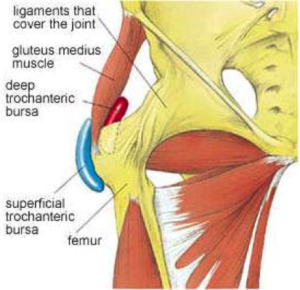 Sometimes they have difficulty lying on their side at night due to compression of the hip bursa. There are 2 populations of patients that present this way – those that have a sedentary lifestyle – professionals who work at a desk fit into this category or those that have an active lifestyle and the hip aBdutors/gluteus medius and minimus are underconditioned. This occurs because the pelvis begins to rock upward and forward with walking. 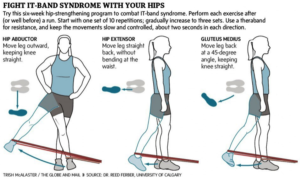 The hip aBductor muscles usually stabilize the pelvis during walking and prevent the pelvis from rocking. If they are weak or overtasked, they fail to prevent the pelvis from rocking and this causes other muscles around the pelvis to be stretched. 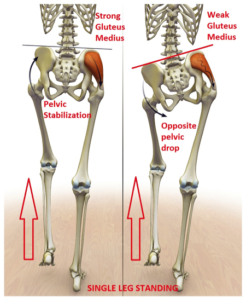 Other muscles try to compensate to try to hold the pelvis stable. Pelvis tilts with every step upward and forward. The forward tilt can cause “Femoral Acetabular Impingement” and groin pain. Pelvis unstable due to muscle weakness. Muscles/Tendons/Bursa inflamed due to above. Perform exercises as below. Note that until the muscles are strong this will continue to be a problem. The exercises may be painful or cause pain but they will continue to contribute to the problem until they are strong so its important to use NSAIDs or Tylenol to address pain and inflammation as a tool to get the muscles strong. **Please check with your primary care doctor to see if its safe to take these medications as they can make blood pressure mediations less effective and are contraindicated with prior history of ulcers. PHONE ALARM recommended 4x per day sets of 10-15 reps.